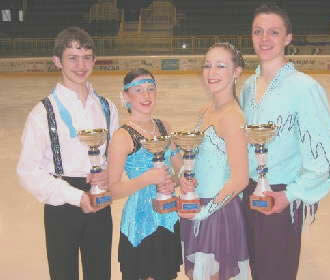 BISC’s two younger dance couples, Tamsyn Pack and Richard Boaden, and Rebecca Forsyth and Christopher Hockaday, did themselves, their club and Great Britain proud when they competed in the Europa Cup at Pinzolo in Italy at the beginning of April. “They were outstanding. Both couples skated very clean programmes. It was probably the best ever skates they have had,” said David Phillips who coaches them with his wife, Lucine Chakmakjian. Unlike the dance classes at other levels, which each had more than 10 entrants, Bracknell’s skaters were competing in a primary level class which sadly had just four entries and one of those, from the Czech Republic, failed to turn up. “It was a shame there weren’t more competitors but that should not detract from the fact that our skaters were excellent. It was a very good event and our skaters were just great,” David added. Both couples had to skate the rocker foxtrot in the compulsory section and a 2.5 minute free dance. Tamsyn, who is 14 this month, and Richard, 16, scored their highest marks ever when they were awarded two 4.0s in the free dance. They missed out on first place by just one score, finishing second behind a Hungarian couple who are their country’s primary champions. And while Rebecca, 12, and Christopher, 14, were third, one of the judges had them in second place. They were accompanied by relatives as well as their coaches: “All four skaters really loved the event and the opportunity of competing abroad,” David said. Tamsyn and Richard, who won bronze at the British Primary Ice Dance Championship in December, will be going all out for gold this year, while Rebecca and Christopher, who won the British Novice Ice Dance Championship in February, will be aiming for a medal in this year’s primary championship. * Simon Waller, who was to compete in the junior men’s figure skating competition in Italy followed by the Spring Cup in Luxembourg, withdrew from both. The Bracknell Open looks set to be the biggest and best ever. With a total of 422, the number of entries is way above the previous record of about 350 and last year’s total of about 300. They include 91 entries in the solo dance championship qualifying and free dance competitions on the first day, April 19, and 331 free skating entries from under Level 1 to senior championship qualifying competitions on April 20-23. BISC’s entries are also well up on the past couple of years with 15 in the dance section plus 32 free skaters, two pairs and 27 skaters in 15 artistic entries. One reason for the surge in entries is the number in the Under Level 1 class for skaters aged 8-10, up from four last year to 42, which has resulted in the class being split in three by age. The number of classes is also up —from 34 last year to 42. It’s going to be a very exciting week and the club wishes all the best to all its members who are competing, especially if they are representing Bracknell.